The Mediterranean horseshoe bat fur is fluffy, with a light grey base. The dorsal side is grey-brown, with sometimes a slight reddish tinge, while the ventral side is white. The length is 43-58 mm, with a 22-30 mm tail. The wingspan is 300 and 320 mm. It weights between 8 and 17.5 grams. The strange shape of the nose is similar to a horseshoe (as in all the Rhinolophus bats). It lives in warm, wooded areas in foothills with caves, where are the roosts and nurseries. 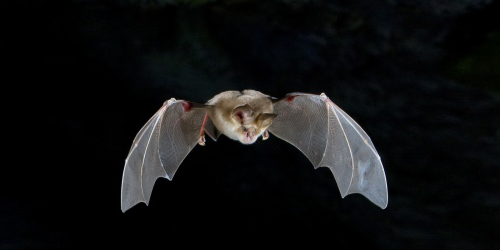 As all the European bats, it eats insects, preferring moths. It is a near threatened species and its threats are the loss of foraging habitat (fragmentation and loss of linear elements such as hedgerows, intensive agriculture and use of pesticides, urbanization and large infrastructures) and disturbance in underground habitats (IUCN, 2016). Locally, the loss of headges around the forests, the loss of prey caused by the agriculture pesticides (the forests are thin and surrounded by intensive agriculture) are the main threats to this species. It has two large colonies in the area of Monte Mauro in the site IT4070011 Vena del Gesso Romagnola. In the area we will maintain and improve forest structure and composition and we will plant hedges around the forests, increasing biodiversity and, therefore, the abundance of prey. IUCN (2016) Juste, J. & Alcaldé, J. 2016. Rhinolophus euryale. The IUCN Red List of Threatened Species 2016: e.T19516A21971185.